Holy Ghost Catholic Church: Welcome! An ecumenical prayer service will be held at Holy Ghost Catholic Church on Tuesday, April 30, 2019 at 6:30pm with three Baptist Churches that burnt down recently. The theme is: "I pray that they may be one." 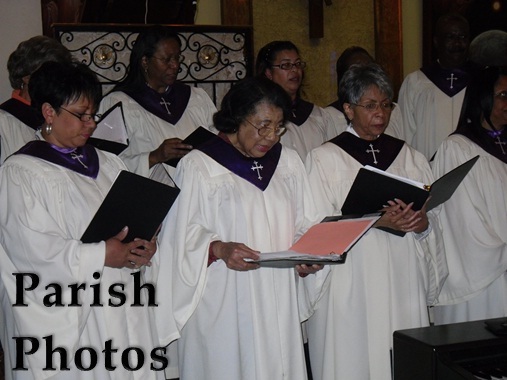 We will start with Music Selections at 6:00 p.m. by Hoy Ghost Gospel Choir under the direction of Mr. Steve Smith. Spring Raffle tickets are now available after all weekend masses and at the parish office. Drawing to be held Sunday, July 7th. Donation: $2.00. This seminar will consist of a series of eight talks relating to the Holy Spirit. Those attending will have a greater understanding of the “Baptism of the Holy Spirit” as mentioned in the Acts of the Apostles and Corinthians. Attendees will also have an opportunity to be prayed with to receive the Charismatic Gifts of the Holy Spirit. There will be a Special Mass held at St. John’s Cathedral in Lafayette on the Eve of Pentecost and at Holy Ghost Catholic Church on Pentecost Day as well. Everyone is welcome to attend. Please call Holy Ghost Parish Office to register or contact Deacon or Mrs. Charles R. Richard for more information. The Sign-Up Session will be presented by Deacon Charles R. Richard. The Most Reverend J. Douglas Deshotel, is allowing Pastors of Parishes to confer the Sacrament of Confirmation on Baptized Catholics who are eighteen (18) years of age or older during the celebration of one Mass on Pentecost Sunday or its Vigil. Candidates MUST meet all of the requirements for the sacrament, if married, married in the Church, attending Mass regularly, and MUST participate in at least two sessions preparing for the Sacrament. If anyone is interested, please contact the parish office during office hours for more information. This is unique opportunity for those who have not received Confirmation. I look forward to meeting with those who are interested. 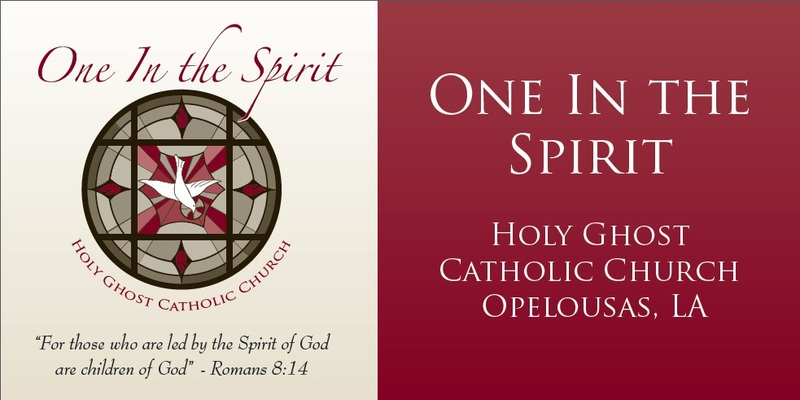 Click on the banner below to read more about our "One in the Spirit" Capital Campaign. This campaign is for raising funds to build a new Parish Life Center which will include a large hall for various events, a well equipped kitchen and class rooms for Religious Education and meetings. Our Mission: Holy Ghost Faith Community invites its members to a personal conversion to God the Father through the Son in the Holy Spirit and is committed to teach and share the Good News of Christ to others. Click on the link above to make an online donation or pay your tithes and camapign pledge using a credit card or bank account. Anointing of the Sick: Please call the office to schedule to anoint someone who is seriously ill or before surgery. If you have a homebound elderly or infirm person, please arrange with the priest for periodic visit and holy communion. Click Here to learn more..
BBQ PORK STEAK OR CHICKEN (white or dark) will be sold on Saturday, May 4th from 11am-2pm. in Holy Ghost Cafeteria. Donation $8.00. Msgr. Curtis Mallet, VG will be the celebrant for the Confirmation Mass. May 19, 2019- 8:30 a.m.- until on the north parking lot of the church. All cooks are welcome to participate in the cook-off. Please call the parish office to register if you plan to participate in the cook-off. Food sampler ticket- $2.00 per sample. Deadline for registration will be Tuesday, September 25th. There will be a $10.00 late fee after the deadline. Classes begin October 14, 2018. We will not ACCEPT anymore students after Sunday, November 25th. Holy Ghost Annual Bike/Walk-A-thon Saturday, May 18, 2019 7:30 a.m. – 10:00 a.m. South City Park For more information please call the Parish Office. PLACE: HOLY GHOST CATHOLIC CHURCH – PARISH LIFE CENTER WHEN: MONDAYS TIME: 7:00 P.M. The St Joseph's Altar will be held on Sunday, March 11, 2018 following 9 AM Mass. Following the blessing and viewing, a meal will be served. Baptism workshop is held after the 11am Mass in the Parish Life Center Holy Family Room.